Blueberry Cheesecake is a feminized Marijuana strain, cheesecake and blueberry flavored. It has an amazing vigor and power and a high production. Blueberry Cheesecake is a feminized Marijuana strain from Female Seeds created from a delicious cross. This selection was obtained due to an exceptional mother which provides a powerful cheese taste combined with an excessive resin production. The other parent is a selection of Blueberry that provides the blueberry taste and also the power. As its name implies, Blueberry Cheesecake has a real cake taste, sweet and fruity, looking like a cheesecake with blueberries. Blueberry Cheesecake harbors an amazing hybrid vigor that gives medium-sized and leafy plants acquiring light blue hues. 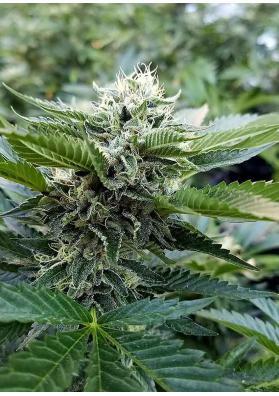 Since this strain stretches much upon the flowering period and can triple its size before the harvest we recommend to give it a very short time of vegetative growth, 15 days is enough. Blueberry Cheesecake provides a powerful and well balanced effect, hitting both the body and the brain. The production is high.